Up till quite recently, Beaujolais was not on my shortlist for great wine experiences. Then Monsieur Brun passed by and I fell head over heels. The first sniff was wild strawberries, next a little white pepper and some sweets. And then, when the fragrant flowery summer meadows opened in front of me, the Fleurie was really up to its name. Fruity, intense, nice tannins and structure. And it lasted for an eternity. So elegant, so lovely. 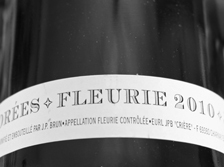 Jean-Paul Brun, owner of Domaine des Terres Dorées, is the man behind this wonderful Fleurie 2010. If I had not known it was a Beaujolais, I would have guessed Pinot Noir from somewhere in the more northern part of Burgundy. Not Gamay. I belong to those who have associated Beaujolais with banana. Was taught so many years ago; “Easy to identify a Beaujolais. The bananas, you can never miss it.” And consequently I have not been very fond of the wine. Even avoided it. The last few years, I have however noted that the bananas have not been as obvious as before. And now, in this wine, they had totally disappeared. Monsieur Brun had repented me. I add a new favourite to my wine list. But what about those bananas? How can a wine have an odour like that? Maceration carbonique used to be an answer. Now there seems to be another explanation. Recently I enjoyed reading Alice Feiring’s personal and very entertaining book*. There I became enlightened. The smell was the result of 71B! This cryptic code is the name of a yeast strain that came into use in Beaujolais during the 1980s. So instead of using the indigenous yeast, the aromatic 71B was added and the banana flavour created. Domaine des Terres Dorées use nothing but the indigenous yest. 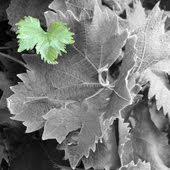 The vinification of the reds are in Burgundy-style with destemming and four to six weeks fermentation with punch down. The Fleurie gets eight months maturation in concrete vats. Then it is bottled, after just lightly filtered, with a minimum of sulphur. The Domaine is located in the small village of Charnay in the south of Beaujolais. 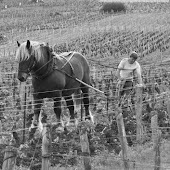 In addition to its Charnay vineyards, 15 ha are found scattered in Côte de Brouilly, Morgon, Fleurie and Moulin à Vent. Thus there is more from Monsieur Brun to explore.